Accessories, Belts, Chaps, Scarves, etc. 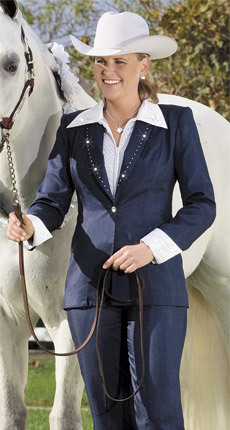 The perfect partner for Hobby Horse SwitchIt tops, this black satin collar and cuff set is topped with dozens of glittering crystals and nailheads for an elegant and versatile addition to your show wardrobe. Collar and cuffs attach easily to any SwitchIt top; one set works with all your SwitchIt blouses. Poly, hand wash.
© Hobby Horse Clothing Co, Inc. The perfect partner for Hobby Horse SwitchIt tops, this black satin collar and cuff set with copper/silver accents is topped with dozens of glittering crystals and nailheads for an elegant and versatile addition to your show wardrobe. Collar and cuffs attach easily to any SwitchIt top; one set works with all your SwitchIt blouses. Poly, hand wash.
Flashback to the fifties with this elegant accessory...a classic concho scarf slide every cowgirl needs. Sterling overlay concho (1 3/4") and ferrule slip over a rolled scarf or silver chain for a new necklace look that's the perfect compliment to movie star collars. 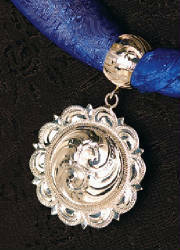 Hand engraved sterling overlay. Scarves sold separately. Matching earring and pony tail set also available. Hobby Horse Star Struck Scarf Slide ON SALE!!! Hobby Horse Star Struck Scarf Slide, new in bag. Scarf slide slips over a rolled scarf or silver chain. 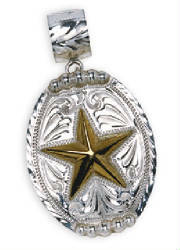 Hand engraved sterling silver overlay 2" concho with oval ferrule. Hobby Horse Miracle Hair Bow. Clasic satin hair bow is accented with a double row of shimmering Austrian crystals. French barrette. Choose black or cream. 1-1/2" Big Cowboy Belt. 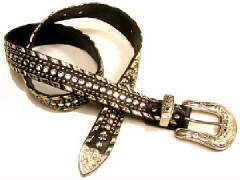 Shown in black with clear crystals, silvertone metal and metal buckle. 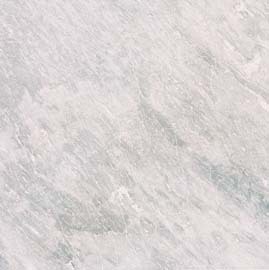 Other colors available - contact us for information. To accurately measure your waist for the proper fit find a simple belt and wear it in the same place you will wear your Kippys belt, with the same clothes you will be wearing. Note which hole you used to fasten the belt and measure from the inside edge of the buckle to the hole you used. Don't be surprised if the measurement turns out to be longer than you think your belt size is. This is the measurement we need to give you a proper fit. 1-1/4" Small Cowboy Belt. 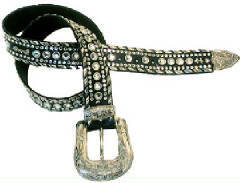 Shown in black with clear crystals, silvertone metal and metal buckle. Other colors available - contact us for information. ON SALE!!! Hobby Horse Tiburon Suit pants in midnite blue, size XL. PANTS only - the suits/jackets are sold out! Note about discontinued items: Limited quantities & sizes available; not all sizes available in all colors.